Fossils of the early land-based ancestors of whales were unearthed in Pakistan in 2001. The experts behind the find claimed it as a 'missing link' between primitive hoofed mammals and the whale family. These wolf-sized animals ran about on land in the Eocene, 50 million years ago. Other newly-found fossils have also added to the growing picture of how whales evolved from land-based mammals. They suggest that early whales used webbed hind legs to swim, and probably lived both on land and in the water about 47 million years ago. 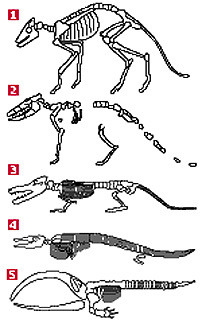 The four partial skeletons were discovered by palaeontologists from the United States and Pakistan. 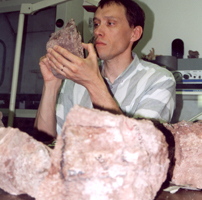 Hans Thewissen, of the Northeastern Ohio Universities College of Medicine, Rootstown, USA, was a member of the team that found the two oldest fossils. One of these ancient creatures was a wolf-sized predator, another the size of a fox. They belonged to a group called pakicetids. Professor Thewissen said of the find that the body looked pretty much like a large dog. The head had all the features of a whale in terms of its teeth and in the ear. It was different from most land mammals in that the eyes were very close set, the snout was very long, and the tail was very muscular and long. The animals had distinctive ankle bones like those of cloven-hoofed mammals. They also had bones in their ears that are unique to the whale family. The new fossils superbly documented the link between modern whales and their land-based forebears, according to Christian de Muizon, of the Centre National de la Recherche Scientifique, Paris, France. According to him, the first whale was not swimming in the seas but was instead walking on land. The two other newly-found fossils were of later creatures, ones which were further down the path towards aquatic life. The skeletons were approximately 47 million years old, and also came from Pakistan. These early whales used powerful webbed hind legs to swim, like otters, and could probably move on land as well. University of Michigan palaeontology professor Philip Gingerich discovered the fossils after a decade-long search. It was clear to Professor Gingerich that these animals could hitch their way out of water and back in like sea lions do today, but they were more aquatic than may originally have been realised. Scientists have long known that whales, dolphins and porpoises - the cetaceans - are descended from land mammals with four limbs. The adaptation from mammals to whales is thought to have taken place over a span of about fifteen million years, starting around 50 million years ago, and all on or around the Indian subcontinent at a time at which this had only just begun its slow and steady collision with Asia. But this was the first time fossils had been found with features of both whales and land mammals. It was hoped that the find could help to resolve a long-standing debate over the evolutionary link between whales and hippos. It confirmed genetic research which placed the origin of whales within the ungulate (hoofed animal) group. It also served to show that the whale's closest living relative may well be the hippopotamus, although the two may have separated long before the process of adapting into early whales began.